← Sneak a peek at my new (to me!) vintage tablecloth hoard! Posted: July 4, 2014 | Author: luray | Filed under: Fun Finds, Holidays, Souvenirs | Tags: Fourth of July, Frankie Welch, Frankie Welch Thirteen Original States scarf, Liberty Bell, vintage Liberty Bell souvenir |Comments Off on Happy Independence Day! Popular mythology notwithstanding, the Liberty Bell wasn’t actually rung on July 4, 1776. But heck, it should have been. So, for once, this history teacher is siding with popular mythology. Happy Independence Day to all our stateside readers! It’s a bit of a damp one here—New England’s getting rain, rain, rain all day and all night from the tail end of an Atlantic hurricane. No cookouts or fireworks for us tonight! It’s all been postponed till tomorrow. We’re celebrating a bit anyway. 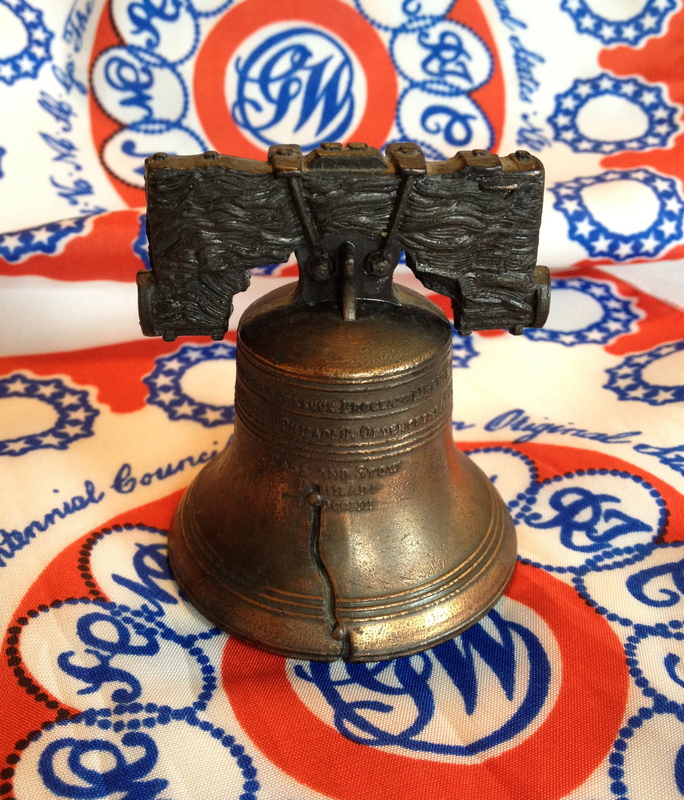 We’ll take turns reading the Declaration of Independence out loud tonight, and ring this vintage souvenir bell mightily when we get to John Hancock’s big fat signature at the bottom. Unlike the real bell, this one has a sweet sound! 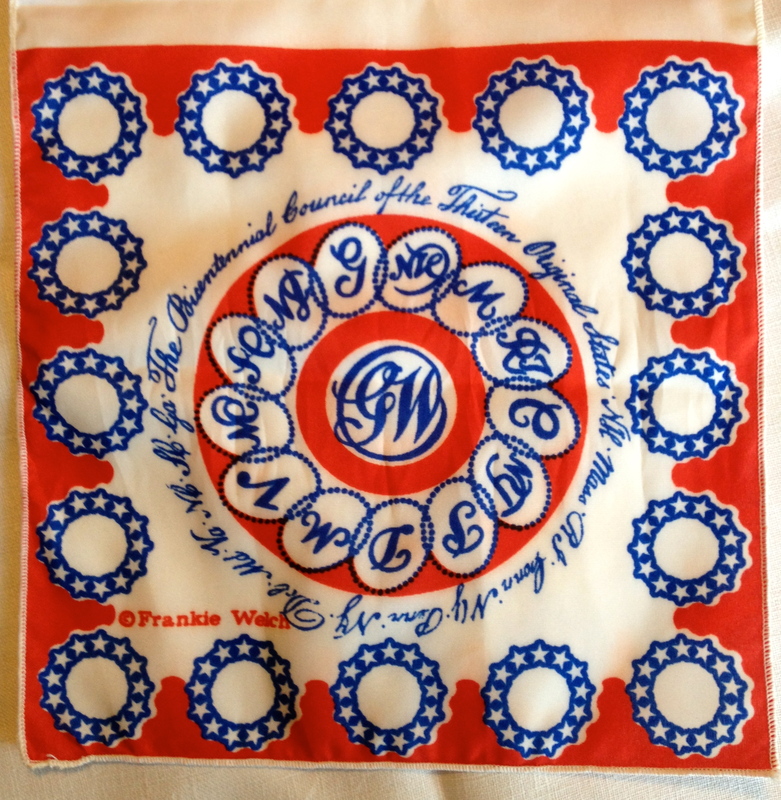 Oh, and that’s a Frankie Welch “Thirteen Original States” scarf from 1976. I thrifted it a couple years ago. That’s just one motif, about 8 inches square. The scarf has four identical motifs in a row. And a tag boasting it’s made of Qiana nylon—ooh la la! Qiana was the quite the thing in the ’70s. See this article from Ornament magazine for a little about Frankie. And a photograph of a model in an absolutely amazing dress made from this same print. I’d love to find that dress!